Above: Brazed plate evaporator. Below: Shell & Tube evaporator. Two styles of evaporators are commonly used in Advantage process liquid chillers. The evaporator is where the process water is cooled during the refrigerant-to-water heat exchanger portion of the chilling cycle. 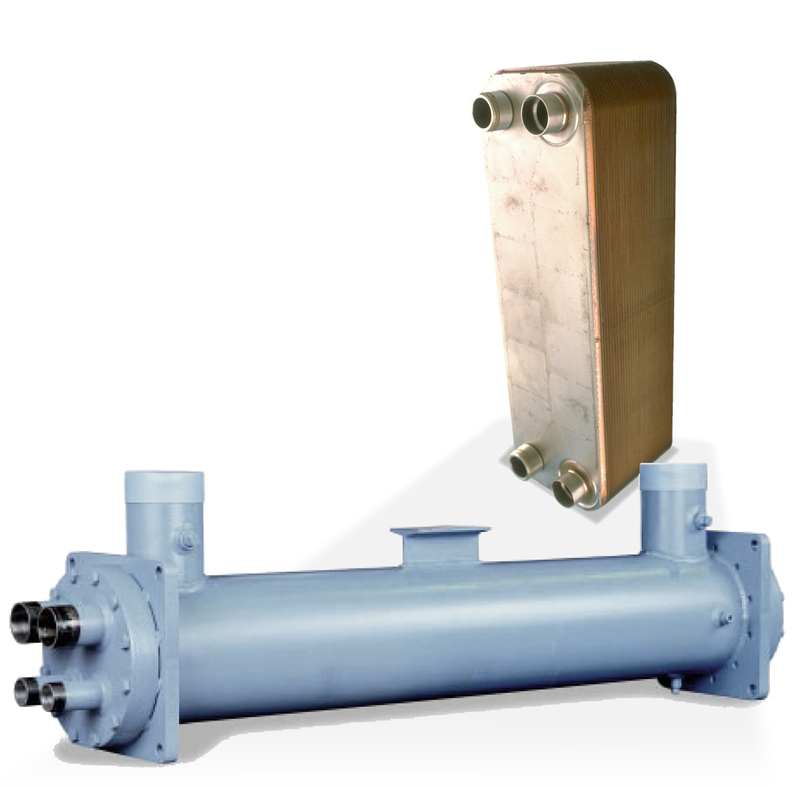 Brazed Plate Evaporators are used in most Advantage portable liquid chillers and smaller central liquid chillers. Their space efficient shape and high efficiency allows for compact machine design. The non-ferrous construction eliminates rusting and alternating plate design makes the brazed plate evaporator less susceptible to freeze damage when compared with shell and tube evaporators. Shell & Tube Evaporators are physically larger and heavier than brazed plate evaporators but are more tolerant of fluid contaminants. Shell & Tube : Carbon steel shell with copper tubes and baffle plates. For more information about Water Chillers and Evaporators call the Advantage Sales Department at 317-887-0729. Would you like to Download FYI #257 to your browser?